Homepage Mobile Phones Google Nexus Ice Cream Sandwich Xperia 2011 update sooner than expected? Yesterday we reported that a Sony Ericsson exec claimed that all Xperia 2011 handset would see an update to the latest Android operating system, Android Ice Cream Sandwich before March 2012. However, apparently owners of an Xperia 2011 handset might see the Android 4.0 update sooner then expected. According to an article over on Xperia Blog, a South East Asia Sony employee took to Twitter to claim that the Android Ice Cream Sandwich update to Xperia branded devices will actually come in the first week of January 2012. 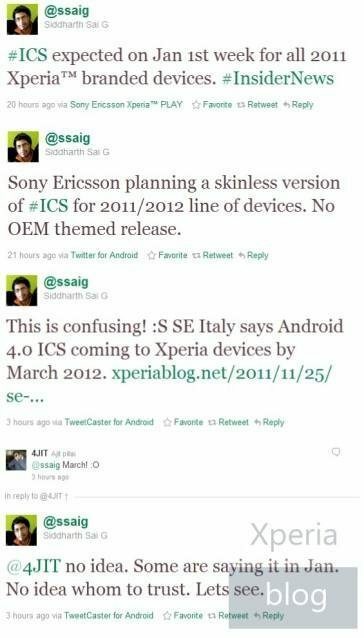 The Sony Employee, Siddharth Sai G further claims that he is somewhat confused over Sony Ericsson Italy’s claim that the Android 4.0 update will roll out by March 2012, but does confirm that some are telling him that January 2012 schedule is the real thing. Siddharth Sai G also revealed via a tweet that the Android Ice Cream Sandwich update will be a “skinless” version and that no “OEM themed release” is on the cards, which if all turns out to be true means Sony Ericsson could possibly push out a “close to stock” version of Android 4.0 to Xperia devices. Of course none of the above has actually been confirmed by Sony Ericsson and thus should be treated as rumour for the time being, but if indeed this employee is spot on then Xperia range owners could well see their devices being updated to ICS sometime in January. thats coming on 14 decÂ ok……….